“Are you girls ready to set off?” Hallie asked. The three painted faces looked up to her in anticipation. “It’s not a race, Millie,” Sigrid reminded her friend gently. “No… but that doesn’t mean we can’t win it!” Millicent insisted. 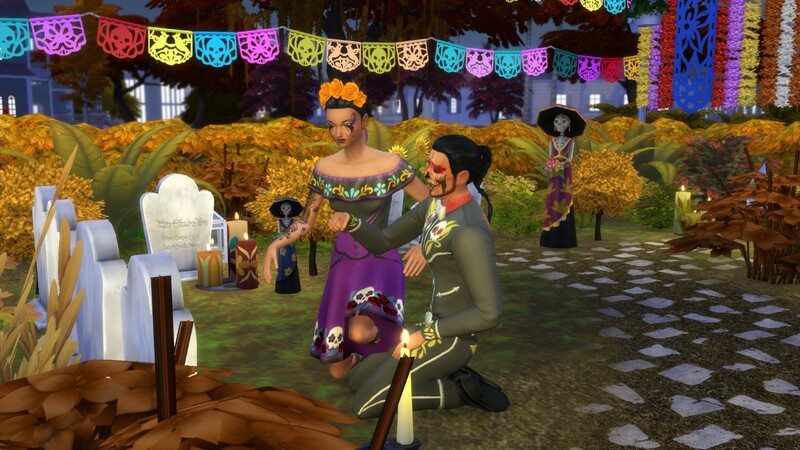 Hallie decided that it might both her and the children some good to celebrate the Day of the Dead this autumn. 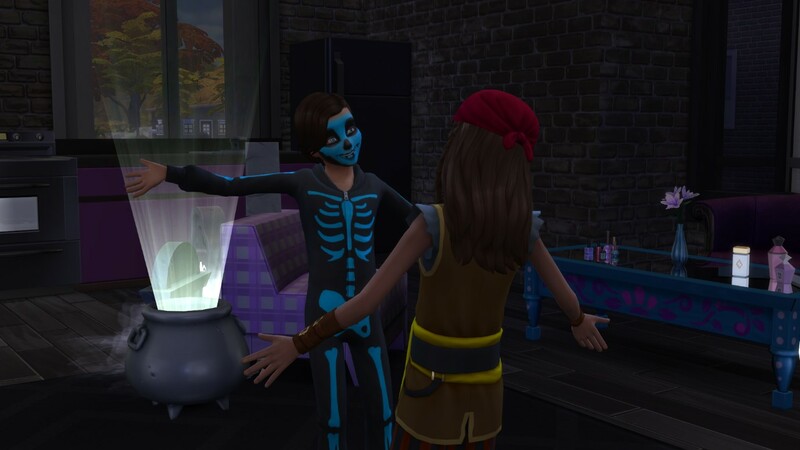 While this was something that had never been seen in Newcrest before, the whole family gave Hallie a hand in decorating the town cemetery, and some of them were even helping her out tonight, keeping track of all the kids. “Only if we win,” Millie muttered under her breath. Alexus had been quiet that evening. She wasn’t sure who she should be commemorating that night. Unlike the other children, she never had parents on this planet. For all she knew, her alien parents could still be alive, somewhere on a planet far away from here. All she was aware of was that she’d been found, already disguised and her memory blank, and that she never told a single soul what actually hid behind her mask. Funnily enough, tonight, she was wearing a mask on top of that mask. And everyone else’s faces were painted too. There was something nice about all of them being the same in that respect. Perhaps she couldn’t quite appreciate what they were celebrating, but she could feel that the night was special. And more importantly, she actually felt like she belonged. That on its own was worth celebrating. Meanwhile, Eun and Donnel, who were accompanied by Yenn, had just reached the cemetery. They all stopped in front of the skeleton couple by the entrance. “Oh come on! Wouldn’t be amazing if we were the ones to actually prove that paranormal activity is happening here?” Eun insisted. Donnie could think of several other words that would be a lot more fitting than amazing. “How about I go in first then?” Yenn opened the gate with a smile. The boys followed right after her. “See? Nothing to be scared of!” Yenn confirmed. The cemetery was filled with lights and colours. And to Donnie’s relief and Eun’s disappointment, there were no ghosts to be seen. Yenn herself had a particular grave in mind, of course. She’d known most of those who were buried here, but there was one person she’d never fail to visit, every time she’d be stopping by. She shook her head, letting out a deep sigh. “Sometimes I’m scared I’ll never get to join you,” she whispered. 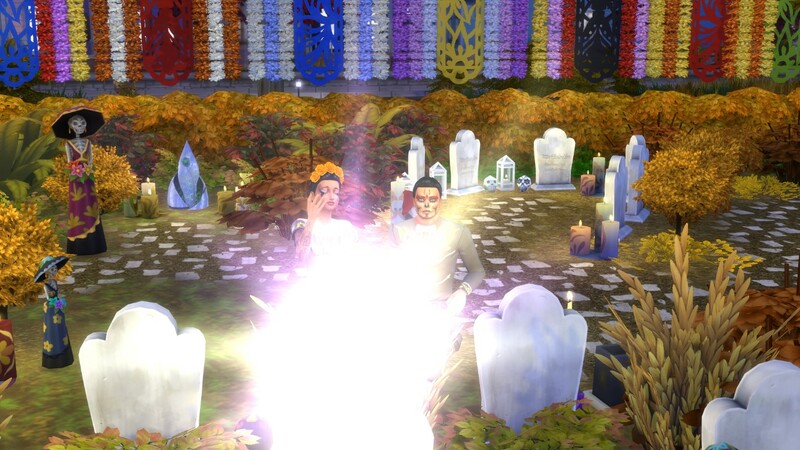 The tombstone lit up in an ethereal glow. Yenn stood up in awe. She’d released Ethan’s spirit many, many years ago. She knew that he hadn’t been attached to the grave for several lifetimes, and yet, she’d still come talk to him here. A smile spread across her face. What did she know. Even having lived and died, and lived again, the great mysteries of life and death would always be something even she couldn’t comprehend. She decided to have a little walk around the graveyard, to say hi to the Bloomer ancestors around as well. Donnie ad discovered one of the Bloomer graves already. But it was unlike any of the other tombstones. Alien. The more he looked at it, the more he was sure of it. He found it heartbreaking that an alien would end up buried here, so far from their home. Or was Newcrest their home after all? How would an alien end up on this very planet, out of all of them? He decided that that was the tomb he wanted to make his offering to. He hoped the alien’s spirit was back in space, where it belonged. “Or if you aren’t, I hope you go to back to the stars now.” he whispered pointing upwards. A warm feeling surrounded him. Hopefully, the deceased alien was happy, wherever they were. As for Donnie, he was left to wonder. 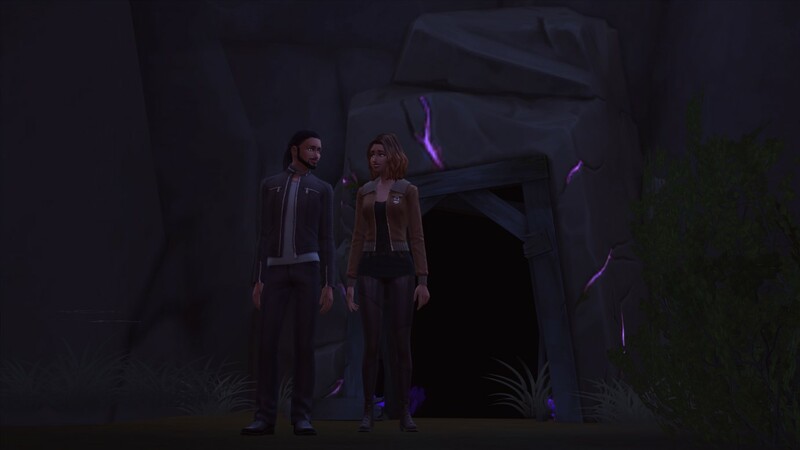 If there could be an alien grave in Newcrest, chances were that the alien who had once lived here was not the only one. Could there be aliens in town still? He wanted to share the theory with other kids. Perhaps Eun would be interested. Although Donnie probably didn’t have enough evidence to support the idea for Eun’s liking. They’d all just laugh at him. Well, maybe Alexus wouldn’t, Donnie decided. She was far too nice to mock anyone for even the most outlandish of ideas. Perhaps he could tell her. Not too far away, another group was getting ready for their walk to the cemetery. “It would appear so. That’s what friends are for, right?” Lorcan confirmed. “Looks like you’re stuck with me again, in case you weren’t already fed up with seeing me at the retreat every day.” He laughed. The two of them ran off towards the cemetery entrance. He grabbed her hand, as if by reflex. Their hands only touched for a brief moment, though it felt as if the time had slowed down to Sera. Lorcan looked at her, realising what he’d done, and he quickly let go. She wished he hadn’t. Or that she had the courage to tell him that. But she was afraid that acknowledging the moment would make it fall to pieces. So she didn’t bring it up. They headed towards the gate. Marla and Camden already entered the cemetery. “Woah, look at all the skeleton ladies!” Marla exclaimed. “The girl? What’s that supposed to mean! I can be a girl and still be way tougher than you!” Marla pushed him angrily. “Oh yeah? You wanna see who’s tough?” He pushed her back. “Right. Sorry.” Camden put his head now. The two of them begrudgingly sat down by the nearest grave to make their offering. “You’re really not into this Day of the Dead stuff, huh?” Camden looked at her. She stood up, growing impatient. “Woah, I think the tombstone just wiggled!” Camden yelled out. Marla turned around. “You’re lying.” She said doubtfully. “Who’s a softie now?” Camden teased as they made their way out. Hallie followed them out, making sure they make it back to the orphanage in one piece. Camden and Marla may not have been the most spiritual of the bunch, but she was glad that they had each other, and that they were both dealing with their loss in their own way too. The graveyard was now empty, aside from Sera and Lorcan, who lingered. “We still haven’t made that offering,” Sera looked around uncertainly. 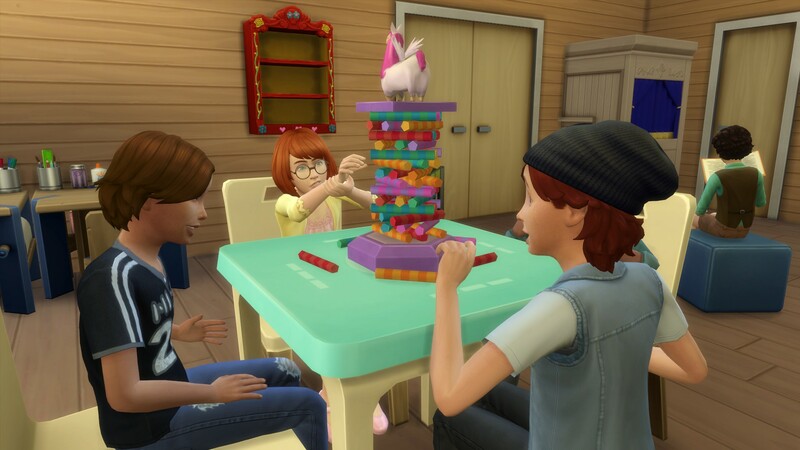 “Hm… can’t go wrong with the legacy founder, right?” Sera figured. She’d never been too sentimental about their family history, but how could she not admire the person who started it all? “So… how does this work?” Sera asked Lorcan as they kneeled by the grave. He was the one that was more in tune with this kind of thing, after all. They laid flowers at the grave and sat in silence. Sera looked at the one right next to the Kirk Bloomer’s. Maranda Bloomer, it read. Wife, mother, friend, and much more. She didn’t know much about the founder’s wife, other than that she’d spent her life by his side, and that they both passed away from old age at the very same time. They must have been true soulmates, she thought. She hoped that one day, she’d get as lucky as them and find hers. And deep down, while she was scared to admit this even to herself, she’d hoped that she already had found hers, and that he was sitting next to her. A flash of blinding light surrounded them. Sera could almost feel the warmth of love and wisdom the legacy founders had once possessed. And then it was gone. “Did you see that! ?” She jumped up, staring at Lorcan. “Did you feel that? I’m not crazy, right?” She asked. “Do you think they… agreed with me?” Sera managed to ask. She was glad the darkness concealed her blushing. Sera beamed. She’d take that. They decided to sit down for a while to process what just happened – it’s not every day one has an encounter with those from the netherworld. “You should see me in the mornings, when I first wake up!” He laughed. I’d love to, Sera thought. “Quit deflecting!” She said instead. Except that what she wanted to say was that she didn’t want to be friends at all. As they exited the cemetery, Sera noticed the sun was already shining brightly in the sky. And for the first time in a long while, she felt like it was shining on her. “Well, I hope this is as good as you imagined,” Vito let out a deep sigh, examining his costume. “Uncle Vito?” Hope emerged from her house, momentarily forgetting all about her own epic outfit. “Yep! All set in our house!” Hope confirmed. The kids burst out laughing again. The two kids dashed over to Hope’s house, where they were greeted by Hope’s parents, turned pirates. “Welcome aboard, me hearties,” Ralph greeted them. “Our ship is a sturdy one, though some say it’s a wee bit haunted, yo-ho-ho! Personally, I don’t know what they’re talking about.” He reached for a sweet with a shrug. Both of the kids let out a shriek when a small ghost figure leapt out of the bowl towards Ralph. “Arr matey, I guess it’s haunted after all!” Carly giggled. “I suppose so,” Ralph grinned. “But that wouldn’t stop two bold swashbucklers like yourselves, would it?” He winked at the kids. Aslan grabbed a sweet and quickly jumped straight back. He shoved it in his mouth, relaxing a little. “Why don’t you grab another one, then?” Hope asked. Hope reached for the bowl. More fog came out. Was this a real ghost, rather than the ghost figure they saw earlier? Hope figured that if she were a ghost, she could imagine worse places to live than a bowl of sweets. No matter what haunted the bowl, it did let her reap her sweet reward though. Maybe it was a friendly ghost, Hope decided. Meaning there was nothing to worry about. She’d already become friends with the monster under her bed, why not just add the ghost to her eccentric list of companions? She placed her hand in the bowl, pulling another sweet out. Nothing happened. She jumped up suddenly. Did the ghost strike back in the end? Her shock slowly transitioned into laughter. Turns out she wasn’t reacting to the bowl, but to Vito who had only just entered the room. “Vito! You almost gave me a heart attack!” Carly could barely compose herself. Ralph and Aslan exchanged amused looks, trying not to laugh. “It’s… very… good.” Carly managed. “You and your daughter have a lot in common,” Vito smiled at Carly. “In any case, you kids ready to move on?” He changed the subject. “Where are we going?” Hope asked. “That sounds epic!” Aslan exclaimed. “Let’s go!” Hope joined in. Vito took them outside of the house to continue on their path. Luckily, they didn’t have to go very far. The “wicked witch” lived just next door. “I don’t know about this,” Hope became a little nervous when they opened the door, revealing a number of spectral figures. “You’re a baby!” She yelled quickly, following Aslan into the house. “Don’t. Just don’t.” Vito sneered. “I mean, you’ve always been a bit of a brat, but this is just a whole new level…” She giggled at her own pun. “The things I do for my kid…” Vito smiled softly. “So… how are you?” Sera grew serious. Sera nodded. A part of her wanted to offer her brother to come over on the days he didn’t have Aslan. But she didn’t. He’d probably say no anyway. Meanwhile, the kids were busy exploring the haunted house. “I don’t know Aslan, those ghosts over there look pretty real.” Hope pointed towards the window. Aslan turned around, rolling his eyes. He jumped back in terror when Hope pounced at him. The girl laughed happily. “No real threat, huh? You seemed pretty spooked… by a baby!” She added. “Ugh! Like I was really scared…” Aslan muttered. “I know what I saw!” Hope teased him. “Awesome!” Hope bounced up and down. Hope jumped at him, trapping him in a hug before he could protest. “You’re the best, Aslan!” She squealed. “Yep!” Hope went straight for the sweet bowl. The children raced outside of the house, pockets filled with chocolates. “Well, did you guys defeat the monsters and find the treasure?” Sera winked at them. “Sort of,” Hope corrected him. “Don’t forget the part when you said I’m cool! And when you were scared of me!” She reminded him. “I was so NOT scared of you!” Aslan yelled, resulting into laughter all around. Vito realised this was the first time he’d laughed since Louis and him broke up. Perhaps one of these days, he would actually genuinely start feeling better. Autumn crept up on the residents of Newcrest. It seemed that one day, the kids were still playing on slipping slides and splashing about in pools, and the next the place was wrapped in reds and oranges. Sera loved the way her retreat looked this season. Or maybe it was just pride about it being quite established now, without losing its magic. The place had been open for a few months, and it still felt like slice of heaven on earth to her. Lorcan probably had a bit to do with it. She definitely didn’t regret hiring him. Many visitors came to the retreat purely to seek him out. He’d never pry, and always knew just what to say. He seemed to make strides as far as Sera’s own family was concerned. “You’re getting really good at this!” He told her at the end of their meditation session. “That’s her doing, not mine.” Lorcan shook his head with a grin. “It made a huge difference.” Sera said, spontaneously hugging him. Lorcan seemed to grow tense at first, but then he relaxed into the hug. It felt good to be so close to him. Sera could feel her heart beating faster than usual. Maybe she should just go for it. Really smooth, Sera, she cringed inwardly. Lorcan seemed a little taken aback by her question. “No.” He said finally. Seraphina suddenly felt as light as a feather. “Maybe it would be simple, with the right person?” Sera suggested helpfully. She could feel her cheeks burning. There were so many things she wanted to ask him, but she wasn’t sure how to put any of them into words. “Anyway, my yoga class is about to start,” he said and walked towards the main pavilion. Sera watched him till he was out of sight. She was confused. Was this a good thing, or a bad thing? At the very least it meant that this was not without a chance, she decided. She smiled. Vito would normally always pay attention to the aesthetics of his surroundings, but these days, the autumn colours were the last thing on his mind. He would have barely noticed the seasons have changed if he wasn’t supposed to be doing this whole Halloween thing for Aslan. The closer to Alyssa’s house he got, the worse he felt. He was miserable enough as it was, and things were only going to get worse once he’d tell Aslan Louis was out of the picture. He stopped in front of the glass door. “Larobb?” Vito let himself in. “You could say that! You guys an item now?” Vito couldn’t help but feel a twinge of jealousy. “Cool!” Aslan stood up and ran to his room. Vito didn’t have to go far to know who his son got his blade of a tongue from. But Alyssa’s words were unexpected. Did Aslan really say those things about him? He barely even called him dad to his face. “Happy Halloween, guys!” Larobb saw Vito and Aslan off. “Thanks, Larobb.” Vito replied stiffly. “He’s pretty cool, Larobb, isn’t he?” Aslan asked Vito. Friends can come and go, but your dad will be there for the long haul, Vito remembered. Plummit Louis. Were you preparing your exit then already? Vito sighed. Over at the Bloomer condos, Vito pulled out a large pumpkin, ready for carving. Aslan eyed him up and down. This did look like fun, actually. “How about a cat? Or a voidcritter? Ooh, I don’t know…” The boy was getting excited. “What do you thin Louis would like? Is he coming over for the trick-or-treating tonight?” Aslan asked. Vito realised he couldn’t put it off any longer. “Is he not coming tonight?” Aslan pouted. Vito’s throat felt dry. He looked at the upset child for a while, considering his next move. He braced himself, ready for Aslan to scream his lungs out. “But… why doesn’t he like you anymore?” Aslan asked. He looked so disappointed, upset and confused. They’ve carved several pumpkins. They even started to have a bit of a playful banter going on. With every Jack-o-lantern, Aslan seemed more and more at ease, more excited and having more and more suggestions for the next. Vito couldn’t remember them ever getting on so smoothly, just on their own. And then something changed. One minute, Aslan was bubbly and animated, and then he drew inward the next. “Something wrong, Aslan?” Vito asked. Maybe the feeling of ease was premature. “No. I was having fun.” The boy said mopily. Vito was touched. It was the first time his son actually insinuated he wanted him in his life. He held back tears and leaned to the boy. Donnie peed his paants! He pushed back the memory. This was a new start for him anyway. A new start for all of them. The girl he was talking to, Marla, seemed like a bit of a tomboy. More importantly, she didn’t seem impressed. “Fine… what I actually did is I jumped into tons of bins around town and scoured them for cards until I got my hands on one.” The boy admitted. Marla laughed. “That’s actually kinda cool! I’ve done that myself too, you know.” She winked. Right behind them, Sigrid watched in awe as Millicent moved yet another stick from the tower. She was rather impressed with her new friend’s Don’t Wake the Llama capabilities. Millicent just grinned. She knew she was excellent at the game. She was excellent at most things, really. That’s because she read every book imaginable and practiced and practiced, no matter the subject or activity. Of course she knew better than everyone else, she smiled to herself smugly. Donnie sighed. They were all already pairing up. And he was the odd one out. As usual. Eun considered himself a budding scientist. He was very pleased when he spotted the chemistry set in the play room. He was even more pleased when he realised none of the other kids seemed to be heading for it immediately. Clearly they underestimated the power of science. Worked for him, he smirked, off to work on his first invention in their new home. And then there was Alexus. Just looking at her made Donnie blush. She seemed in a world of her own, busy narrating a story with the doll. She exuded a strange aura of quiet confidence. “Hey!” Millicent’s annoyed shriek broke Donnell’s train of thought. “Oh come on, it’s not rocket science,” Camden shrugged and tugged at one of the sticks. The tower collapsed with a loud thud. “What have you done?” Millicent scolded him crossly. “I hate you!” Millicent pouted. “It’s ok, we can fix it,” a soft melodic voice interrupted. They all turned towards Alexus. She sounded so unusual, and oddly calm. “No, of course not,” Camden said quickly. “Sorry Millicent.” He muttered his apology. “See? This is looking loads better already.” Alexus smiled. “But we woke the llama. HE woke the llama!” Millicent said grumpily. Camden wasn’t paying attention to her. There was something about the girl in pink that he couldn’t quite put his finger on. She was definitely the first girl in pink that he was interested in talking to. “Do you want to play, Alexus?” He asked. Bullfrogs, Donnie cursed silently. He hung his head down, returning to his book with a loud sigh. She seemed kind. When she greeted them earlier, she told them they’d be the first children to ever live in this particular house here, and that that made them very special. Not many people had ever called Donnie special. He liked the lady already. “I’m ok.” He beeped nervously. “Would you like to play Don’t Wake the Llama with the others?” She asked. “I’m sure that’s not true,” Hallie disagreed. The boy smiled to himself as his crayon slid across the paper. Hallie noticed the pouty Millicent watching them. One crisis averted, another to go, she thought. “Maybe. But he did.” Millicent insited. Meanwhile, Sigrid and Alexus noticed Donnell’s drawing. “Wow, that’s a really pretty rainbow.” Alexus said to the boy. His cheeks turned pink. “Hallie said she wanted us to do paintings for the room.” Donnie informed her. “Ooh, I’d like that,” Sigrid smiled. They all crouched around the activity tables. Maybe this place would be different after all, Donnell thought. All was well, Hallie breathed out with relief. The doorbell rang at just the right time. They finished the tour in the back garden, with all the kids getting excited about the slipping side around them. Yenn and Hallie watched them line up, squealing. The kids took their turns on the slipping slide, one by one. Donnie joined the back of the queue. The closer he got, the more anxious he was. “Millie… is it possible to do the slipping slide wrong?” He asked. And with that, she slid away. Donnie stood on the edge of the slide. It was his turn. He wasn’t sure what he’d been so worried about. This was the most amazing thing ever. “I hear we’re going to share a room,” Alexus told Millicent excitedly. “Yeah, I peeked in.” Alexus nodded. Vito admired the view of the commercial district of Newcrest for a moment. The golden sunset glow made this evening on the rooftop terrace particularly pleasant. Perfect, he thought. Seems everything was working in his favour. “You taking a photo of the scenery in your head?” Louis chuckled as he came over with can of juice. “Not that we’ve watched all of them together,” Louis pointed out pragmatically. “Well, no, true,” Vito uttered. Not quite where he wanted to steer the conversation tonight. Louis looked amused. “No you didn’t. You were a hormonal teenager that was high on life after having his first kiss.” He laughed. He stood up, not taking his eyes off Louis. Louis looked at him, perplexed. “You going somewhere?” He jumped up to his feet. He watched Vito kneel in front of him, almost as if in slow motion. Louis struggled to form a coherent sentence at first. Vito looked at him hopefully. Vito’s entire body grew tense. He stood up stiffly. He couldn’t quite read Louis’ expression. “Yes, I know what I want for my future. For our future.” Vito nodded. “I don’t exactly feel that way,” Louis started slowly. “No. You don’t understand.” Louis said quietly. He looked very pale all of the sudden. What he said next would echo in Vito’s head. Vito covered his mouth in shock, but he wasn’t aware of the motion. He felt as if he’d lost control of his own body. He just stood there, frozen in time. And in heartbreak. “I’m so sorry.” Louis looked at him sadly. As soon as he asked, Vito knew he didn’t want to hear the response. “I guess we’re just holding on to the past.” Louis muttered. Then don’t do this, Vito wanted to say. But his voice betrayed him. He couldn’t get a single word out. “But things have changed. We’ve changed.” Louis concluded. 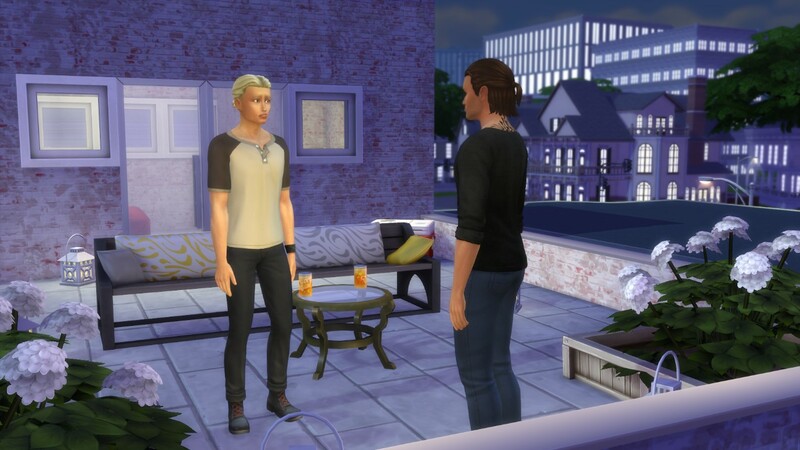 “I guess this is goodbye,” Louis said awkwardly. Louis kept giving him guilty looks on his way out. Louis deserved to feel guilty, didn’t he? Vito wanted to be angry. He wanted to hate him. After all, it was nobody’s fault but his own that they fell apart. He couldn’t bear staying in the studio, but he didn’t want to go home either. He paced along the evening streets of Newcrest until he reached the condos. But he didn’t head towards his. He knocked on the door in an odd state of limbo. “Are you ok?” His sister asked, looking concerned. It felt surreal to say it. Especially to her. But she didn’t laugh at him, or remind him that this was all his doing in the first place. She seemed genuinely shocked. Vito had been asking himself the same question. But somehow, he already knew the answer. “I don’t know what to say.” Seraphina looked at him uncertainly. “Yeah. So did I.” Vito said. And with that, Vito dragged himself to his place. Leaving behind a rather baffled and worried sister. Getting home didn’t particularly bring Vito much solace. It felt like Louis was following him, staring at him from pictures in every room. A reminder of what could have been. Should have been. And what was now never to be. He’d have to take all the photos down, Vito thought. But not tonight. He stared at the smiling Louis on the wall. He still couldn’t believe he was gone from his life. They were enjoying the sunset just an hour ago. And now he was alone. Without the one he’d thought was his other half. He slid the walk in closet open, crawling inside. Sliding the door shut behind him, he let his body fall to the floor. And he cried like a baby. Hope wigged her feet to the rhythm. As usual, her aunt Hallie’s house was filled with music. “Are scrambled eggs ok?” Hallie asked. “Well they’re coming back soon, at least try to make it look like you’ve missed them when they ask.” Hallie winked. Hope pondered Hallie’s words. Truth to be told, she hadn’t really had a chance to miss her parents yet. It wasn’t that she didn’t love them, but while they were away on their trip, Hope felt like she was having an adventure of her own, staying with all the different relatives a couple days at a time. This was the final stop before they returned, and Hope was pretty excited about it. Aunt Hallie always seemed so effortlessly cool. The little girl could only hope to be like her one day, when she grew up. “These smell real yummy.” Hope sniffed the plate eagerly. “So what would you like to do on this fine morning?” Hallie asked. “Well, I like to start every morning with a bit of a dance,” Hallie told the girl. So they spent the next half hour or so shaking to the tunes and laughing. Hope could most definitely picture a worse morning… and so could Hallie. They’d passed a good chunk of the day in the park across the street – of course Hope wouldn’t miss out on a chance to play pirates for a while. Hallie was actually having a blast. She’d always enjoyed spending time with Hope of course, but who knew looking after the tyke on her own would be so much fun? It felt strangely rewarding. After Hope’s newest pirate cruise, they decided to give fishing a go to get a pirate dinner – apparently Hope was a more skilled angler than Hallie was. Probably thanks to all of her pirate experiences, Hallie joked. “Yeah! Maybe I can swim in the lake again!” Hope beamed. They found Seraphina in the yoga pavilion with a handful of guests floating about. “That’s why you need to go to the class,” Hope joined in. “Very true!” Sera nodded with a chuckle. Hope was no longer paying attention to the conversation, she spotted a man with a very comfy looking dressing gown and slippers. Hope checked herself out in the mirror. She was pleased with the attire. “Don’t you look snazzy!” Sera joined in. “You’ve got a matching one!” The girl squealed. “I figured we’d be robe buddies.” Seraphina grinned. “Ooh, we need to document that!” Hope exclaimed, pulling out a phone to take a photo. Sera was caught by surprise, but she tried to relax into a smile. “Look at us all robed up,” she said softly, trying not to get even mushier over the photo. Needless to say, with very little success. She wouldn’t fight it. She couldn’t wait to have a little Hope of her own. Maybe someday. For now, meditation would have to do. While Hope was bonding with her aunt, Hallie took a bit of a walk around the grounds. She’d not really explored the retreat yet. She was impressed with Sera, who would have thought that she of all people would have created this place for contemplation? She noticed a man floating in the gazebo. Hallie had seen Yenn levitate during meditation before, but something about the scene in front of her made her feel drawn to the man. Perhaps it was the setting. Or maybe it was just how peaceful he looked. Even now, Hallie rarely ever felt completely at peace. She hadn’t even realise how close to him she’d gotten and that she was probably gawking until he greeted her. “Hi,” he said in a deep voice, slowly descending back on to the stool. “Seraphina’s mentioned you.” He spared her the explanation. Hallie wondered how much Sera may or may not have told him, but she was grateful she didn’t have to recount the story of how she found herself an orphan being raised by the Bloomers. “In any case, sorry for staring.” She said, about to leave him on his own again. “It’s just, you looked so serene…” I couldn’t help but feel jealous, she wanted to say. He tilted his head, studying her face for a moment. “Would you like to chat for a bit?” He asked. “I’m a decent listener. Besides, it’s almost a part of my job spec.” He laughed. Hallie hesitated for a split second, but then she nodded. They sat down by the pavilion, soaking in the late afternoon sun. “I’ve been through a few bumps,” Hallie admitted. “I feel better now, but I wouldn’t mind a bit of that peace you’ve been exuding. I guess I’m still trying to find myself.” She laughed awkwardly. Hallie’s eyes lingered on his scars. “You seem to be managing more than fine.” She told him. “I’ve never had much of a temper problem. I just…” She stopped herself, embarrassed. Hallie stared at him blankly. “Huh.” Hallie wasn’t sure what to say. She’d known for all these years, but at the same time, she didn’t. It seemed that he’d given her the answer she didn’t know she was looking for. Hallie’s mind trailed back to that night in Oasis Springs, when she saw the ghosts of her parents. She still wasn’t exactly sure if it was real or not. But there was a person made of flesh and blood sitting beside her and telling her the same things the ghosts had said. That she was fine the way she was. She could just hug him, if they hadn’t only met less than an hour ago. “No need to thank me.” Lorcan said. “You’ve made these invisible walls trapping you somewhere you didn’t want to be. I just pointed out they were there. Hallie thanked him again, and they’ve said their goodbyes. It definitely wasn’t the last time she’d be visiting Sera’s retreat and seeking his advice, she knew as much already. It wasn’t till much later that day when she’d realised that even though she’d told him so much about her innermost feelings, she still didn’t have the slightest clue where he saw his purpose or what his story was. “Eww, I don’t want girl cooties in my room,” Aslan wrinkled his nose at the sight of Hope. “They’re both critters of some sort,” Hope shrugged. “Pfft, I bet I could beat you!” Hope said with vigour. “You? Please, I’ve got years of practice on you! I remember when you were just a baby pretty much attached to a basinet!” Aslan snickered. “What!? You must be cheating!” He exclaimed. “Guess you’re not the voidcritter master you thought you were,” Hope giggled. “This is SO not fair!” Aslan growled. “I’m not hungry.” Aslan grumbled. As soon as they got downstairs, Aslan’s mood improved as if by magic. He became giddy and impatient. “Hi Louis! So cool you came! You’re almost never over when I’m here!” Aslan bounced up and down. “Well I’m here tonight, aren’t I?” Louis chuckled softly. “So Aslan, is Louis like your second dad now?” Hope asked. “You and me both,” Vito smiled. “Well, now that you mention it…” Vito joked. Vito beamed while making the finishing touches to the salad. He was trying to play it cool in front of the little ones, but the truth was he loved the sight of Louis together with the kids chatting away and laughing at the dinner table. He could definitely imagine this being a regular occurrence. Him, Louis, Aslan, maybe another child… or two? In any case, Vito knew this was what he wanted. He wanted them to be a family. He could just picture it. Their future together. He’d never felt this serious about anything before. But this felt right. He wanted Louis in his life for good. Vito served the meal and sat down at the table. “How’s the salad, everyone?” He asked. “It’s good,” Hope said politely. “Hey, be nice!” Vito told him. Vito nearly choked on a carrot. “Well that’s stupid!” Aslan grumbled. “I couldn’t agree more,” Louis nodded. He turned to Aslan. “Wasn’t there from the beginning, though.” Aslan muttered. “That’s because you only met when I was born, silly,” Hope reminded him. Aslan rolled his eyes. Like the baby would ever get it. “No, I’m sorry you got caught up in that. You shouldn’t feel the need to apologise.” Vito told him. “And for the record, you handled it pretty well, actually. No wonder Aslan wants you for a dad.” He attempted a joke. “Heh, I wouldn’t know the first thing about being a dad,” Louis chuckled. “You’re definitely better with him than I am,” Vito gave a small shrug, growing serious. “Do you want kids, Louis? I think you’d be good with them.” I know you would, he thought. They both drifted into worlds of their own for a while. Then Vito broke of the silence, wrapping his head around Louis. “Well, it’s not like it’s something you have to worry about immediately, unlike me.” He laughed casually. Though I hope you will, sooner rather than later, he added in his mind. Carly and Ralph may have felt guilty about leaving hope in Newcrest when they jetted off for their honeymoon, but their worries were unfounded. The girl was getting spoilt rotten. With not one, but two doting grandparents eager to cater to her every need, she was having the time of her life. “Would you like some ice cream, pumpkin?” Leo asked her enthusiastically. “Ice cream? Really? But mommy never lets me have ice cream this late!” Hope exclaimed. “Well, good job your mommy’s not around then, isn’t it?” Leo winked. Hope stared at the cone in her hand adoringly. It was huge! Bigger than her head! She could barely hold the thing. But it was delicious. “Nothing beats your grandpa’s homemade ice cream,” Pauline nodded approvingly. Hope pondered what he said. After the copious amounts of frozen goodness, Leo reached for one of the thick books in the shelves by the fireplace and let Hope pick a night time story. She was enthralled in his narration. Hope may have taken more after her father, but she ate up all of the bedtime stories Leo read with the same vigour her mother once had. When she woke up the following morning, Hope made her way to the kitchen to find her grandparents in the middle of showering each other with affection. The girl didn’t make too much of it, after all, her own parents were usually like this too. She wondered if all married couples acted like that. 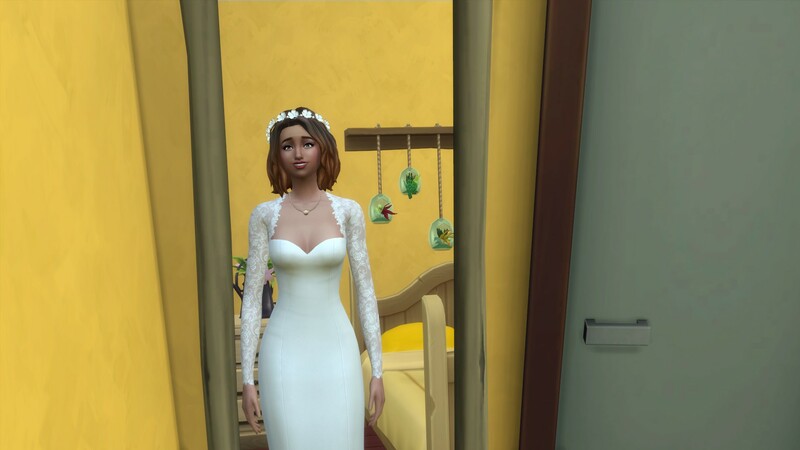 She’d probably not get married, she decided. The thought of blowing kisses to a boy sounded pretty gross to her. Besides, space pirates don’t have time for distractions. Leo and Pauline smiled at each other. The girl hung around the garden until aunt Yenn called for her. “Please do,” Sera told her aunt as she approached. 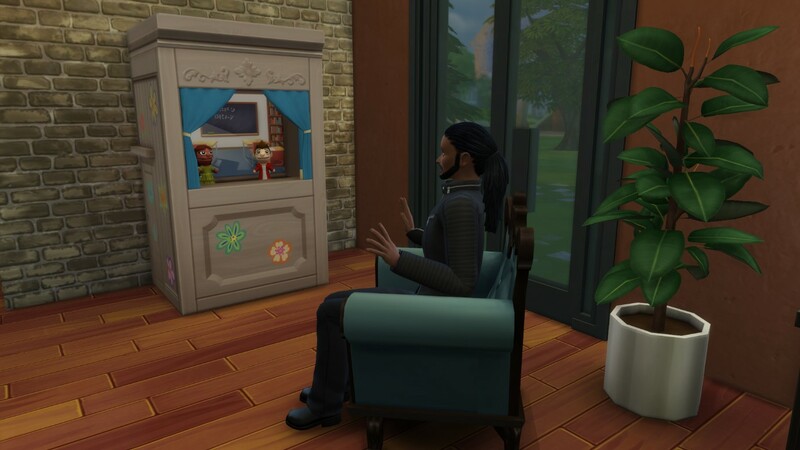 “Aunt Sera has finished her Newcrest build, you see.” Yenn explained. “Ooh, what is it?” Hope was intrigued. The three girls walked across to the brand new meditation retreat by the golf course. “This is quite impressive, Sera!” Yenn said. Seraphina led them into the main house. “Wouldn’t be you if there wasn’t an opportunity to exercise,” Yenn smiled. “Can I try?” Hope asked. Luckily for Sera, Hope was always eager to explore new places. And this one didn’t look like anything she’d seen before. “This is the meditation gazebo. I just love it,” Sera sighed happily. “Not sure if that’s what aunt Sera had in mind, sweetie,” Yenn chuckled. “Go for it,” Sera told her. The girl dove in with a big splash. She entered the pond carefully, swimming towards Hope. “Quite something you’ve got here,” A deep voice behind her interrupted. It’s been quite some time since she’d seen the yoga instructor. She never did return to his yoga class after that first lesson. She did start practicing on her own, though. 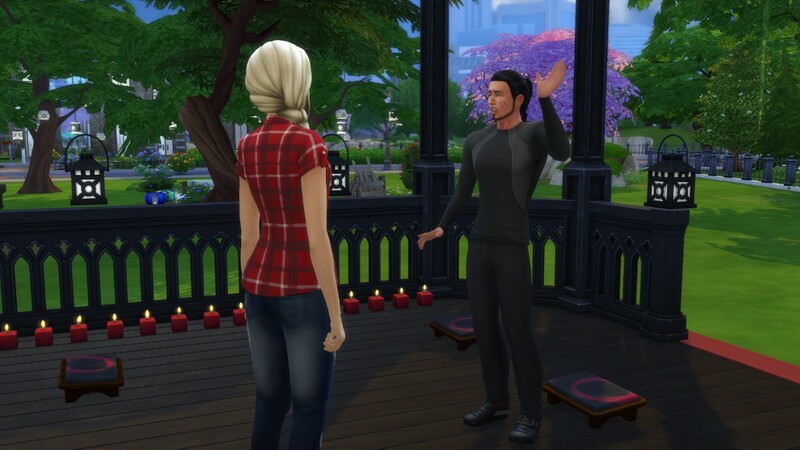 “I must say I was surprised to see you’ve built this – didn’t think you liked yoga that much, after you never came back.” He said, as if he’d read her mind. “Well either way, you’ve done great. Newcrest could definitely use a spot like this.” He said politely. “Well, what do you think?” Sera asked after they’d walked around the grounds. “I’m getting a hang of this tour guide thing…” She giggled. “Are you hoping to become a regular?” Sera joked. “I thought you worked at the gym.” She said cautiously. “But I don’t think it would be a good work dynamic.” Sera said awkwardly. Because your face is too symmetrical and your eyes are too deep and the last thing I need is to fall for yet another guy that looks perfect on paper… Of course she couldn’t say that. “Do you still think I’m trying to chat you up?” He asked. Ok, seriously, could this guy read her mind or what? “Would people actually go through the trouble of applying for a job just to get a date?” Lorcan raised an eyebrow. “Look Sera, I do think you are beautiful, but I assure you that’s not where I’m going with this. I don’t date. Prospective employers, or anyone else.” He added. “Yeah… that’s why you’re needed around here.” Seraphina replied with a grin. On second thought, this was a fantastic idea, she figured. Author’s note: The archelogical dig site where Carly and Ralph went on their honeymoon was built by the amazing Great Simphony. Hope was on the captain’s deck, commanding her space pirate crew. It was a narrow escape from the planet of Blimphlus, but they were leaving with a huge treasure and with only a handful of monsters chasing after them. They might just make it… A tentacle landed on the control panel with a loud bang! The little girl opened her eyes, waking up abruptly. She jumped out of bed, scoping the room around her. It’s ok, she told herself firmly. It was only a dream. Or was it? She could have sworn she just saw a tentacle crawling at her feet. She sped outside of the room, slamming the door shut behind her. There was a monster in her room! She had no clue what to do. Luckily, she knew who would. They ventured into the hallway. Hope stopped before the door to her room. Ralph smiled, kneeling next to the girl. “They do?” The girl asked uncertainly. “You’re never scared, though!” Hope pointed out. “Not most of the time,” Ralph admitted. “But there was a time when I was terrified.” He grew serious. “Ok.” The girl took a deep breath. “Shall we go have a look at that monster?” Ralph asked. “It’s from the planet Blimphlus,” Hope told him. “Thank you daddy!” Hope tackle hugged him. “How about we get you dressed and go play with your puppet theatre for a while?” Ralph suggested. Hope was deep amidst performing a play by the time Carly came into the room. Carly observed them silently, listening to her daughter alter her voice and watching Ralph’s animated reactions. She almost didn’t want to disturb them. You had to give it to Ralph, he was a great father, Carly smiled to herself. “It’s ok,” Hope emerged from the booth, giggling. “I guess we’ll play later. Here’s Captain Duckhorse back, daddy.” She handed Ralph the action figure. “You have him.” Ralph said. Everything seemed a lot less spooky in the light of the day. Hope decided that if the monster came back again, she’d confront it and see what it wanted. They ate breakfast together, and Hope was ready for the school bus. “Learn lots and stay out of trouble,” Carly told the girl. “Don’t do anything I wouldn’t do,” Ralph winked. “I’m a space pirate, I can’t make any promises.” Hope said. “You know, a lot of space pirates don’t listen to their moms.” Ralph informed Hope. “But that’s because no other space pirate has a mom as clever as yours. She knows everything. So if you listen to her advice, you’ll come back from all of your adventures… which means more adventures!” He grinned. Hope seemed to be mulling that over. “I guess that makes sense. I’ll be good.” She sighed. Carly laughed. “As long as you do.” She pulled him closer. They arrived at the store, passing Vito’s photo studio on the way. Ralph beamed. It was shaping up to be a great day already. And that was before they even opened the door into their kingdom. 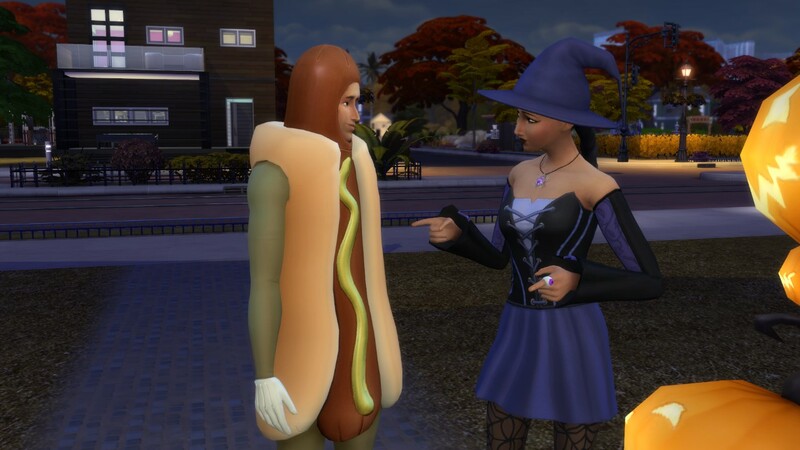 They’d only opened their shop recently, but it had gained quite the reputation in Newcrest. Partially due to the fact that one could find almost anything there, from books to artefacts, from practical furniture to obscure knickknacks… depending on the day. And some people just loved it for the ambiance. Especially the bookworms. Ralph was always in his element at the shop, turns out he not only enjoyed making and sourcing some of the goods, he also had quite the knack for talking people into buying them. Meanwhile, Carly would stick to the more routine tasks like ringing up customers, restocking and inventory… unless book recommendations were involved. Which, to be fair, happened often. Half the store was filled with old books with the most delicious smells. Carly adored it. Before they knew it, closing time rolled around. “I have the utmost faith in your craftsmanship,” she corrected him. “Really, lately I find myself spending most of my time being impressed with you.” She gave him a timid smile. “I wasn’t just talking about the bathtub, Ralph,” Carly said gently. A wide grin spread across Ralph’s face. “Lottie… are you saying…” Ralph was speechless. Ralph picked her up in his arms and twirled her around. “This feels like a déjà vu,” Carly laughed. They got the shop ready for locking up, though Ralph had been rather extra affectionate while tidying up. “What is it?” He looked panicked for a split second. 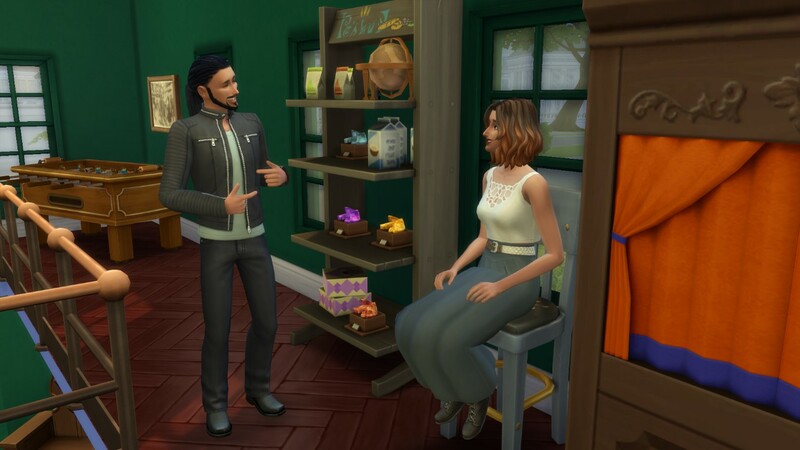 Author’s note: I will be putting the shop on the gallery, but it’s actually on the same lot as Vito’s photo studio, so if you’ll want it you’ll need to download both (of course you can easily knock one or the other down). Also, you’ll need to check CC on in search to find it because the photos in the studio stupidly count as CC. As usual the origin ID is ThePlumbobBlog.